Bones and teeth belonging to the ancestors of the short-statured human lineage known as “the Hobbits” have been discovered on the Indonesian island of Flores. The fossils, which date back 700,000 years, are offering fresh insights into the origin of this mysterious species. In two new papers in Nature, researchers from Australia’s University of Wollongong describe the fossilized remains of three small-bodied hominins thought to be the distant ancestors of Homo floresiensis, an extinct species of ancient human popularly known as the “Hobbits.” The fossils, which include an adult mandible and several teeth, are the first skeletal remains to be discovered on the Indonesian island of Flores outside of Liang Bua—the cave in which paleoanthropologists discovered the original Hobbit remains. These ancient humans were brought to the world’s attention when the remains of a single adult individual—who would have stood a mere 3½ feet tall—were discovered on Flores in 2003. Since then, another nine specimens have been recovered, including one complete skull. These remains date back to between 95,000 and 50,000 years ago and belong to an entirely new species of nascent humans, one dubbed Homo floresiensis. Scientists have speculated that their miniaturized characteristics were the result of insular dwarfism, which happens to animals that have become isolated on small islands with limited access to food. This evolutionary process caused the bodies and brains of these early humans to shrink down in size, but they retained their ability to stand upright and use basic stone tools. The precise origin of these Hobbit-like humans remains a mystery. One theory is that these individuals evolved from an isolated population of large-bodied Homo erectus, and then dwarfed over time. The second theory is that these early humans were descended from another member of our genus, such as Homo habilis. Complicating matters further is the suggestion that they’re not a distinct species at all, and that these individuals were suffering from some sort of congenital disease that caused their short stature. Based on a morphological analysis of the new fossils, it now appears that these so-called Hobbits were in fact descended from H. erectus. 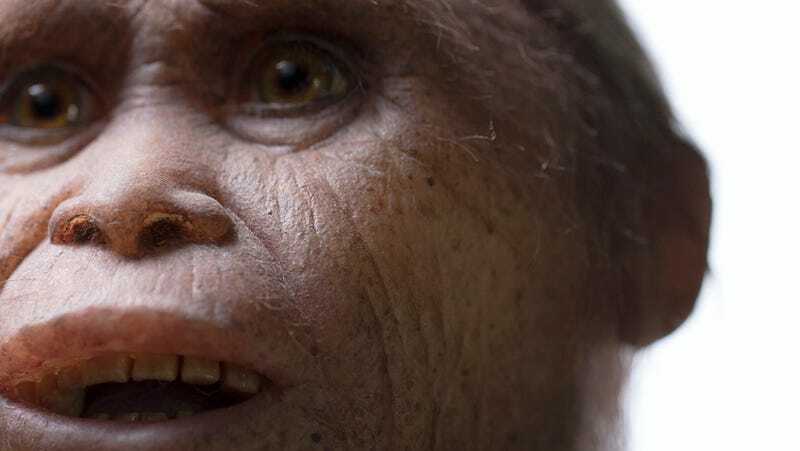 About a million years ago, a band of these early humans got stuck on the island of Flores. Then, over the next 300,000 years, they gradually dwarfed in size, living on the island’s savannah-like grasslands alongside elephants, rats, and Komodo dragons until their mysterious disappearance some 50,000 years ago. The new fossils were uncovered by Gerrit van den Bergh and his colleagues in 2014, after the researchers performed a series of test excavations to identify which stratigraphic layer was most likely to yield the remains. The fossils, which include an adult lower right jaw fragment and several teeth, were found in layers of sedimentary rock at a site called Mata Menge. These finds pre-date the bones discovered at Liang Bua by more than half a million years, dramatically extending the timeline of the Hobbits on Flores. Using several dating techniques, the researchers say the fossils are about 700,000 years old. The recent discovery of one million-year-old stone tools pushes back their time on the island even further (unless, of course, these tools were made by some other group of humans). A mandible discovered at the site. Interestingly, the adult individual was about two-thirds the size of later Hobbits, which means these ancestors were either equal to or smaller than their descendents. That means these insular humans obtained their small stature in just 300,000 years. That may sound like a long time, but it’s not much in evolutionary terms. The process of insular dwarfism, it would appear, works quickly. How a group of full-bodied H. erectus made their way to the remote island of Flores remains a matter of speculation. These early humans, who could just barely forge stone tools by smashing them together, couldn’t possibly have had the technological capacity to make boats. Speaking at a press conference yesterday, van den Bergh said they might have been swept to the island by a tsunami, where they remained marooned and isolated. This region is known for volcanic and tectonic activity. What’s more, the 2004 Indian Ocean earthquake and tsunami swept individuals out into the sea as far as 38 miles—including a woman who was seven weeks pregnant, and later rescued. Another possibility is that this newly found lineage pre-dates the first hominin arrival on Flores, and that it wasn’t H. erectus that got stranded on the island. This would mean that some immediate group of hominin ancestors came through the north from Asia, possibly via Sulawesi. “That’s another hypothesis that we have to keep in mind,” said van den Bergh.